The Smith® MBA-30300 medium duty welding and cutting outfit features quality construction throughout and is built to provide reliability and extended service. This oxy/acetylene torch kit comes with Smith's proven in-tip gas mixing technology. This combination greatly improves operator safety and increases torch life. Torches are covered by Smith's True Blue® LIFETIME WARRANTY, the longest and strongest in the industry. The outfit features rugged, highly accurate regulators. Regulators are backed by a 3 year limited warranty. Outfits come complete with safety and operations manual. Graf-Tite� soft seats - Resilient Graf-Tite� seat material protects tip seating areas from nicking to maintain positive seating. Requires less replacement than metal-to-metal seat designs. Compressible soft seats are practically indestructible and withstand extremely high temperatures, resulting in longer tip life. In-tip mix - Each tip is a precision engineered mixer for combining preheat oxygen and fuel gas to attain maximum efficiency. Adds resistance to flashback. Slip-in tip design � just hand tighten After the first tightening with a wrench, only hand tightening is required to seat the tip, saving time when changing tips. Quick and easy tip changes encourage use of right tip for the job. Removable high-pressure seat - Allows cleaning from back of tip. Three-tube construction - Gases are kept separated, eliminating mixing tube burnout. Our thick-wall, high-capacity stainless steel tubes provide high gas flow and superior strength. Ease-on oxygen cutting valve - Allows smooth piercing and keyhole free starts and restarts. Triple o-ring seal - Provides positive gas seal, and allows rotation. Internal threads - Threads are protected from damage if the torch is dropped, eliminating costly torch repair, replacement or downtime. Double-tube handle - Tube-within-a-tube design provides strength while reducing weight. Internal tube is silver brazed for extra protection, strength and leak resistance. Adjustable valve resistance - Special PTFE packing provides a gas-tight seal while allowing the �drag� to be adjusted to the individual preference. Stainless steel ball-style valves - Corrosion-resistant balls and brass seating surfaces provide gall resistance and positive, chatter-free seating. Replaceable hose connections - Hose connections are easily replaced if damaged. If your tank valve has male threads, you should choose a CGA 300 (female) regulator. Note: will not fit "B" or "MC" acetylene cylinder. PLUS get a $50 Build With Blue™ Cash Rebate from Miller® with the purchase of a Smith® medium duty torch outfit AND get up to an additional $200 Cash Rebate when you purchase qualifying Miller® or Hobart® branded accessories (excludes welders and plasma cutters). Download Build With Blue™ Rebate Submission Instructions HERE. All rebate forms MUST be submitted electronically to Miller no later than July 15, 2019. Offer expires 6/30/19. We do not ship directly to Canada we work through an exporter.. If you wanted to purchase a Smith Welding & Cutting Outfit - Medium Duty Series 30 MBA-30300 for shipment to Canada you would have to generate an order through our web site. You will reach a point in the order check out process which requires your shipping information. Once you indicate shipping to Canada our exporter will take over and provide you with your shipping costs. Once you have received this information you can continue with the order or you can opt out of the order. The shipping service is Bongo International. Where do I locate the serial number on this product for the purpose of product registration? 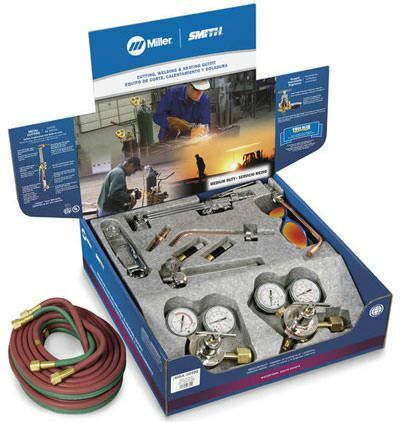 The Smith Welding & Cutting Outfit - Medium Duty Series 30 MBA-30300 does not have a serial#. The individual components in the kit , torch handle , and cutting attachment each have a 3 letter date code which is stamped into the body of the item. Is this product made in USA? 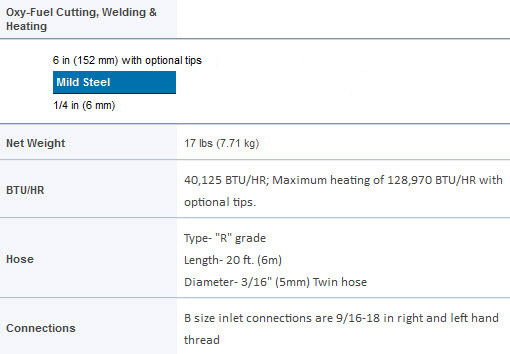 Is the welding tip that comes with this outfit suitable for welding 4130 chromoly thin wall tubing, or must I buy another tip? I plan to use this outfit for homebuilt aircraft construction tasks. Is this outfit well suited for such work or would you recommend some other outfit? Thanks for your time. The welding tip that is included does not work well with light gauges of steel, which is primarily what I work with. It blows holes right through the weld. I do like the fact that a rosebud heating tip was included with the kit. Handy to have. The cutting torch is awesome. Blows straight through pretty much anything you can find. Also, I don't like the torch-mount flashback arrestors. They add weight and length to the handle, which isn't really something I desire. Quality you would expect from Miller/Smith. Used other brands and wanted to give this a try, don't regret. Best price I found online and quick shipping. Would recommend Miller/Smith and Cyberweld. This set is built to last when I received the package, I could not believe how well put together this unit is. Not to mention how good it looks. Great torch as always, around $250.00 less than my local welding supply. ConsPackaging was not so great. The box was not taped/stapled closed so the parts were scrambled. High Quality Oxy/Acet Welding Outfit for a very reasonable price. This is a great oxyacetylene outfit for most of us. There are heavier ones, but this is far better than most you will find in a high end hardware store. It is truly "Medium Duty". The quality and finish are excellent, and it works better than any other torch I have used (I've used quite a few). ProsSensitive and easy adjustment. Safety features included. True chrome plated finish. 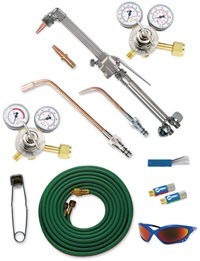 Every part you need except the tanks and stand for most purposes: welding, cutting, heating, brazing. ConsI cannot think of any downsides. I suppose, if you want a really heavy cutting torch, this might not be the item to buy. But if that is what you want, most people would simply buy a good Plasma Cutter. Finally, I have found the Great Product I have been looking for. You can tell before even putting this torch kit together that it is a quality product. The look and feel of quality. Love the fact that you don't have to have a wrench every time you want to change heads or tips. Exactly what I have been looking for. And, it is made in the USA !!!! Love it. Great American made tool. I need more tip sizes, but will buy them as need arises. I got the 510 fitting for my acetylene regulator and leased a couple tanks from my local suppler. I got medium sized tanks. Hose that came with it is 20ft. ProsDoesn't require a tool to change tips. and because of this its easy to twist the tip to a different angle of attack. ConsIt won't sing me a lullaby and is rather cold in bed. I use my torch for a wide range of heating, welding, and brazing purposes, mostly in the creation, repair, and restoration of machinery and equipment in a low-volume, non-production environment. I've been extremely happy with the high quality and the excellent fit and finish of the Smith torch and regulators. They are beautifully-made tools, and using them is always a pleasure. Buying the outfit saves money over buying the individual components. I also own a Smith AW1A (Versa-Torch) handle, which I highly recommend. ConsThe kit comes with on-the-torch-handle flashback arrestors, while I'd prefer to have on-the-regulator fa's.